I’ve really enjoyed reading the stories on this site and some of the stories spark memories of some of my own experiences in Iraq in the 1-37 Field Artillery. We landed in Kuwait in mid-November 2003 and I don’t remember it being unbearably hot, just hot. I do remember the descent into the Kuwait City area and seeing sand absolutely everywhere. After some training and preparation in the desert we would convoy through Iraq in Humvees whose only protection was plastic doors and roofs. We drove all the way past Baghdad to a former Iraqi Air Force base outside of Samarra. All during the 3-day convoy we never heard a shot fired or experienced anything too hairy. At the old air base our battery set up a firebase to provide 24-hour a day fire support for the infantry that was operating throughout the area. Still nothing had happened and I think many soldiers believed that Iraq wasn’t as dangerous as it had been portrayed in the news back home. In order to provide 24-hour coverage we worked two shifts, one from noon until midnight (which I was on) and one from midnight to noon. We fired a few harassing and interdicting (H and I fires) with our 155 howitzers which were technically combat missions but still nothing too exciting had happened. One night we received a rude awakening. I had just gotten off my shift and went back to the bunker that I was sleeping in. I lay down on my cot and had just dozed off when I heard a soldier saying to my Lieutenant whose cot was next to mine, “Sir, I think we are under attack.” This woke me up and I immediately heard the sound of gunfire outside. I slipped my boots on and walked over to the door and stepped outside. The door closed behind me and I see these tracers going over my head. These were our guys firing from nearby OP. They were firing their .50 cal across our position at a pickup truck that was just outside the base, driving around not too far from us. There was a guy on the back of the pickup lobbing mortars on our base. It was pitch black out there and the sound of those .50 cal tracers was really spooky to say the least. I had heard an AK 47 fire over me in training before but this was much scarier. Sounded almost like little jets flying over me but a little different. I went back in the bunker and we all got our gear on and headed down to the gun line to offer whatever assistance we could. My biggest fear at that point was not the enemy but our own green troops. Remember, this was 2003 and over 95 percent of the soldiers in my unit had never been to combat, yours truly included. It was a short walk of about 35 meters from the bunker to the gun line. We could see nothing but a few lights bobbing around in the gun area. We would yell “friendlies coming through” to avoid becoming friendly fire statistics. Finally, to my relief, we reached the battery area without being shot by our own soldiers. I then heard the “thump” sound of a ramming staff punching in round. 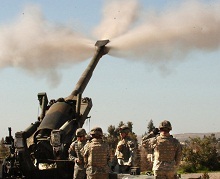 Then there was a loud “boom” and I saw a bright flash of light as the gun fired on the mortar truck which was destroyed by the .50 cal fire and now howitzer fire. After the threat was neutralized we stayed up a while longer while all personnel and equipment were accounted. Probably about 2:30 am our shift went back to sleep. About 4:30 in the morning our battery conducted a counter fire mission to neutralize an insurgent attack using 107 mm Chinese made rockets. These Chinese rockets were simple. They’d lay them in the side of a ditch and angle them towards a target. Then they’d light the wick and hope for a hit. Those things weren’t very accurate but they carried a fairly strong punch and they could kill you if they got a lucky hit. Later I’d see some of these rockets go through multiple living containers before exploding. Our battery only got to do firebase duty for a little over a month. After the Samarra operation our entire brigade (3rd Brigade, 2nd Infantry Division) moved north to the Mosul area where it was a totally different mission. Thankfully our battery completed our year in Iraq without any serious casualties or deaths. Our unit would return there three more times before the war was finally over.